Let’s travel to Santo Domingo, Dominican Republic with Angie Rodriguez from TheLarimarShop! What a great place to create. I can only imagine the endless creative inspiration that comes from living in such a beautiful country. Read on to find out Angie’s inspiration that is unique to her part of the world! I was born and live in Santo Domingo, capital of the Dominican Republic. Our country shares the eastern side of the Hispaniola island, the western side is Haiti. It is special because our island was discovered in 1492 by Christopher Columbus, who landed on the north coast. 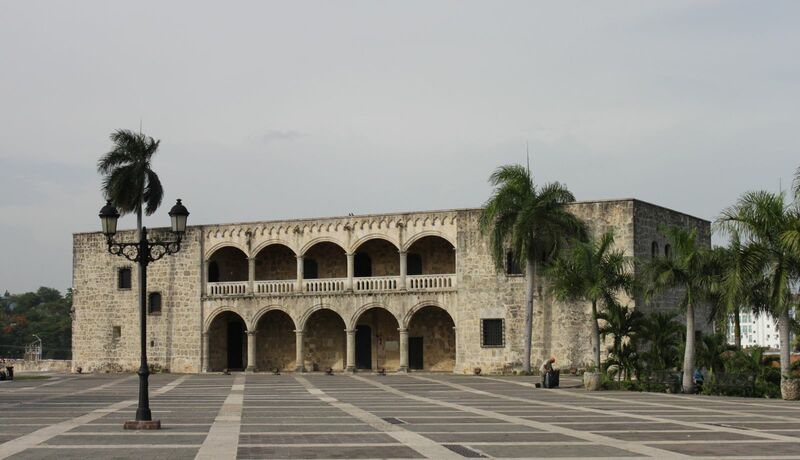 Santo Domingo city, with its Colonial Zone, was placed in 1990 by UNESCO on the World Heritage List. Santo Domingo – It holds claim to the first cathedral, monastery, university, hospital, customs house and other monuments in the New World. In the Colonial Zone you will find 11 blocks of historical and fun-filled streets, where part of the city walls can be seen, holding the oldest permanent settlement in the New World. There are over three hundred pieces of history, which include houses, streets and monuments. The Dominican Republic can be undoubtedly regarded as a tropical paradise, with its many breathtaking and secluded beaches, many with pristine waters, white sand, and wonderful islets with endemic species that you can reach with speed boats and catamarans. All water sports are available, specially at Cabarete on the north coast and La Romana on the east coast, with beautiful hotel resorts. Eco tourism takes you to mountains, rivers, and waterfalls, where you can practice many sports such as paragliding, horseback riding, river rafting, mountain bike, swimming and much more! We also have must see lakes such as the Enriquillo Lake – the largest salt water lake and the lowest in the Caribbean, home to American crocodiles and many endemic species. When I learned about our Larimar stone, which is unique to the whole world being the only blue pectolite found so far, I decided to get involved with this natural beauty. The blue and blue-green colors, as well as the wonderful patterns reflect the blue colors of our Caribbean sea waters and the blue sky with white clouds. It is a stone that is hard not to fall in love with. This stone has been linked to the lost continent of Atlantis, as well as to dolphins, attributing special qualities to our Larimar stone. Larimar is now our national stone and is a real representative of our country. With our Larimar, our Dominican craftsmanship has the opportunity to display its creativity to the world. We are planning to participate in a Bazaar in Santo Domingo this fall for in Santo Domingo, Bazaars are one of the best way to promote handcrafted items locally!